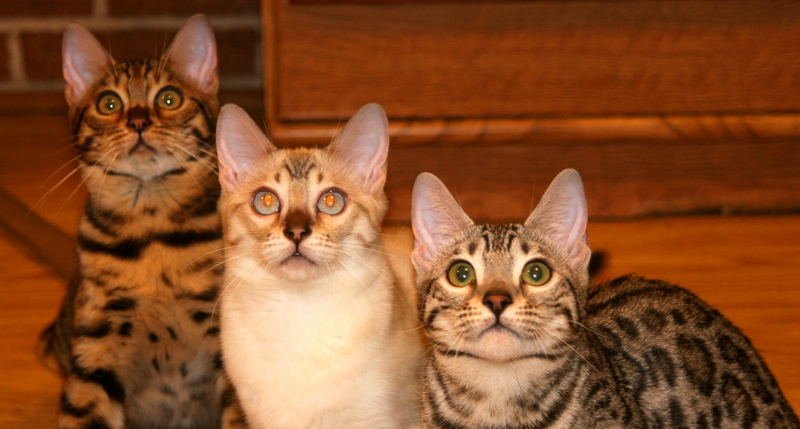 Lileopard Bengals, beautiful little leopard cats, big purr-sonalities! Bengal kittens for sale! Lil'Leopard Bengals is a hobby breeder located in the little town of New London, Texas. We are conveniently located between Longview/Tyler, 2.5 hours east of Dallas, 1 hour west of Shreveport, 4 hours northeast of Austin, and 3 hours from north Houston. We are a TICA registered cattery and have signed the voluntary code of ethics. We have been raising Bengals for 15 years! We offer cutting edge Bengal kittens that not only have stunning leopard like coats but are on the threshold of confirmation perfection. We strive to produce kittens with outgoing, interactive personalities that adapt easily in any home. Our babies are family raised in our home and are handled daily. They are socialized with dogs, other cats, and of course people. Cheradee Benson, owner, brings her wealth of knowledge and experience having been a veterinary technician for even longer than a feline enthusiast and entrepreneur. When you choose LiLeopard Bengals as your breeder, you will not only get a furry friend, you will also have our lifetime support. Our previous customers are familiar with our dedication to the breed and to them! We will be here to answer your questions even after you take your baby home. We show our cats and have them health checked on a regular basis. Our cats are regularly HCM screened and are Felv/FIV negative. We offer a lifetime HCM replacement guarantee as well as a 2 year comprehensive health guarantee. We strive to keep our cats low in quantity and high on quality. We breed for the total package: rosetting, type, and purr-sonality! We are focusing on dramatic rosetting without losing correct confirmation, health, and temperament. We mostly breed for brown rosetted Bengals, but also have snows, silvers, and occasionally marbles. We usually have a litter in the works so check back until you find a little beauty to fall in love with. Once you get a Bengal you never go back! Copyright © 2019, Lileopard Bengals. All rights reserved.